500 X 1 Ounce 2019 American Eagle Silver Coin, 999 Fine. Sealed mint box (containing 25 tubes of 20 coins), brilliant uncirculated (BU). 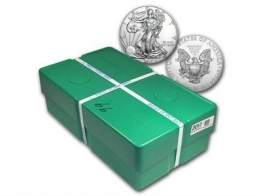 Each box contains 500 1 Ounce 2019 American Eagle silver bullion coins. The coins are packaged in 25 tubes of 20 coins each. 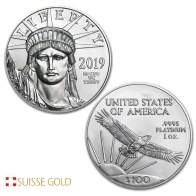 Each 2019 silver American Eagle coin features an image of Lady Liberty walking with her arm reaching out, and the sun rising in the distance. At the bottom of the coin is the year of mintage. The reverse of the coin features an image of an American Eagle. The weight, fineness and face value of the coin is also located on the back. The American Eagle silver coin has a face value of one US Dollar. The American Eagle silver coin is the only silver coin produced by the US Mint. The US Mint also produces the American Eagle coin in gold, silver and platinum. In addition, the US Mint produces the American Buffalo and St. Gauden coins in gold. 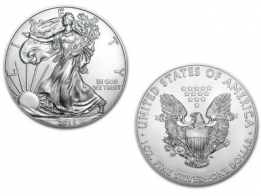 The American Eagle silver coin is a popular choice for silver investors, looking to buy silver coins. Many European investors chosing to buy silver Eagles will select vault storage for their purchase instead of delivery, as vault storage is VAT-exempt. All coins contain 99.9% pure investment grade silver bullion. 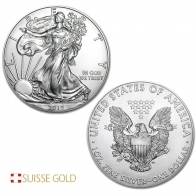 To sell silver American Eagles, please contact us or click here to find out more.